Scratch that previous post about the Koston One. It has a set release on June 1 (tomorrow). Neither Manchester United or Barcelona are my favorites, but my heart rests with Man. U. for this match. Here's a slow jam for the weekend to set the mood. On June 4th there will be two shoe releases: Air Jordan 3 "true blue" (Momentum) and Nike SB Koston One (Momentum Marketplace). The Jordan 3 will come with an original Jordan box with the same construction as the past cement three. I was told today that the Koston will definitely be released in Canada as well, which excites me as well. Remember, it is built with TPU suede and the Lunarlon sole. The Koston one is planned to be my next skate shoe. Here's a tour of Koston with the SB team promoting the Koston One, Eric's first signature Nike SB shoe. There is good skating from the team, along with clips of Kobe, Michael Pena and Paul Casey. I would still love to pick up these shoes, but there is rumor they might not make their way up to the great white north. If not hopefully I can find them when I go to Las Vegas. This is my ideal skate shoe. RoyLyn, owner of Vaughn de Heart has just finished celebrating two years of creating quality garments. Vaughn de Heart is based out of California but also has many Italian and French influences. I honestly think he has been one of my original hello saskatoon followers, as well as one of my first twitter followers. I have no idea how he found the blog but I appreciate it. 2 year anniversary from Vaughn de Heart on Vimeo. Hopefully we will see more good things from Vaughn de Heart. Best of luck from us at hello saskatoon. It's almost that time of the year again where Saskatoon is full of summer festivals and events. My favorite one would definitely be the Jazz Festival. There is a diverse range of music so that everyone can find something that they will enjoy. The shows that stand out for me include: Macy Gray, Ali Shaheed Muhammad and De La Soul. I will most definitely be attending De La Soul. The group will be playing behind the Delta Bessborough along with Arrested Development on July 2. De La have been together since 1987. The three members have been together since high school and as far as I know, have never played as a group in Saskatoon. I remember years ago, I was really enjoying old school hip hop and I was led to De La Soul through a Tribe Called Quest. They always have a good beat and some funny rhymes to go along with it. I hope that everyone will have the chance to make it to a show! Just shot some random clips of yesterday from morning to night. Work, supper, and hanging out with friends (don't worry we were only smoking hookah). TakeFive Trading is a distribution company that deals with clothing and a lifestyle that I am interested in. 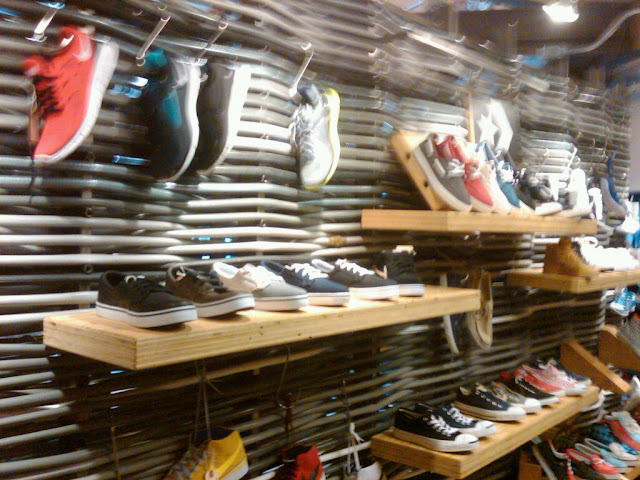 They distribute brands such as Incase, Alife, The Hundreds, Reigning Champ, Huf, Keep, G-Shock and 10 Deep. I have met and talked to a few people that are involved in the business and they are awesome. Just recently that photo taken by 1 Take photography (post below) has made it to the TakeFive blog. "We are a full service distribution company of lifestyle brands in Canada. Currently we service 500 active retail partners from three showrooms in Canada; our home base in Vancouver and a showroom in Montreal and Toronto. Our combined experience brings over 13 years of retail ownership and 20 years plus in sales and marketing at the wholesale level. Take Five prides ourselves with the ability to grow partnerships and brands for longevity." I am pretty stoked to see 1 Take photography's photo's popping up on websites and especially since one is of myself. My co-worker and friend has been a photographer ever since I have known him. He has his own company called 1 Take Photography and has been working on a project for the year of 2011. Each day he takes a photo and I tried to help out by being day 61. I felt a bit awkward on camera but it was fun and I would definitely do something like this again. Today I was actually planning to check out a new eatery called "Green Leaf", which just opened on 22nd St. between 2nd and 3rd Ave, downtown. Unfortunately, it closes at 5:30pm on weekdays, so that blog post will have to wait for another day! 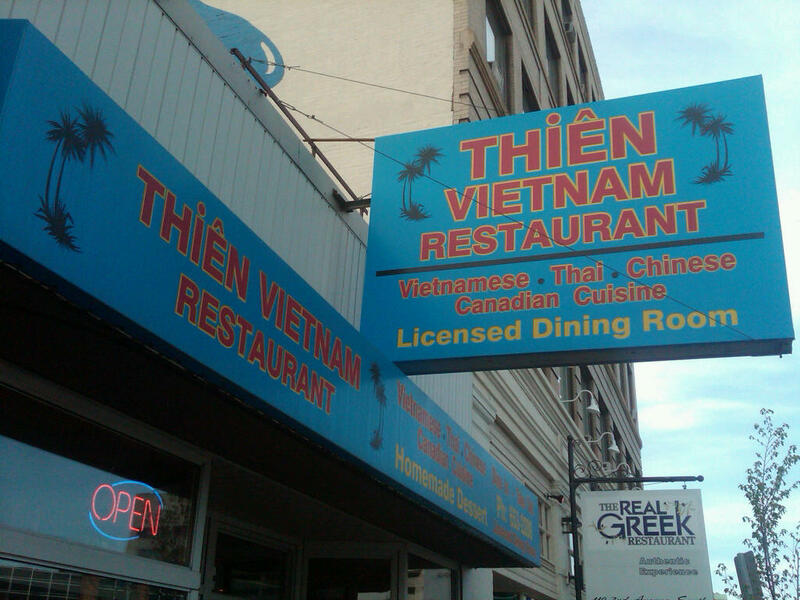 Since I am overflowing with street smarts and problem solving skills, I quickly assessed the situation and all possible alternative plans, and without looking back I swiftly re-located to Thien Vietnam Restaurant around the corner (on 3rd Ave). Of course I used chopsticks, I love chopsticks! If you like chopsticks, spring rolls, or Vietnamese food in general, you will, without a doubt, enjoy Thien Vietnam Restaurant. Check it out. Two pair of Air Jordan's released this past Saturday. The Wolf Grey V and the Year of the Rabbit VII are available at Momentum on 8th street. One of my favorite places to grab a drink and some appetizers would be at Bacchus, one of the lounges located within Earl's. It's nice to be able to socialize and listen to good music at the same time, they even play The Weeknd. Service from the bartenders, waiters and waitresses are always on point, even when it gets busy. The menu isn't overly creative, just a whole bunch of gourmet meals. I enjoy items such as ribs, chili chicken with rice and a refreshing Albino Rhino (house beer). The only concerns are that it is generally pretty busy and that there are some sketchy people that like to hang out by the bar at times. Stop by and visit the homies this summer, they'll get you a drink to quench your thirst. Ladies and Gentlemen, we are very excited to introduce a SICK contest in collaboration with our friends at Provadenic Clothing Company! Get stoked and pay attention. YOU will take out your supersonic photo capturing device 3000 (aka. camera), dust it off, do 15 jumping jacks, spin in circles until you aren't sure which way is West, and then set out on an incredible journey towards capturing the most creative, unique, and outstanding photo of the city of Saskatoon. 1) Consider Saskatoon... What defines it? Is it even definable? What makes it unique? What do you love about it? Can you capture it in a photo? Can you attempt to capture it in a photo, or even come close? 2) Take a photograph. A fresh, unique photograph. -It must be your own (no copping other people's work). -Write a sentence or two that describes or portrays the connection between your photograph and our city, how it is unique, and why it is a winner. 3) Email your photo entry with the caption, as well as your name and phone number, to hellosaskatoon@gmail.com no later than June 30, 2011. OHMYGOODNESS THERE IS SO MUCH INCENTIVE!!! 1) Provadenic X hello saskatoon T-Shirt. The winning entry will see their photograph printed (and credited) on our limited edition, collaboration T-Shirt, and receive a shirt of their own! 2) hello saskatoon Blog Header. The winning entry will see their photograph incorporated (with credit) into a new hello saskatoon blog header! 3) Gift Card. $60 to a local store of your choice! Here are some random pictures that I have taken with my camera around the city. Self confidence is a reoccurring problem for myself, whether it's school or sports. Tonight it definitely got to me while I was skateboarding. We were up at Rona and I was trying to grind a bench into a bank, but I had a lack of commitment and self confidence. This happens quite often to me and is extremely frustrating. It's even worse when I am skating because I become flustered easily and lose all concentration. You know what I'm talking about? It's like when you're trying so hard to do something but are having little progress. Tonight all I could think about was going home a failure, and I feel that way right now. A personal goal is to think more positively and show less fear. Just a little rant about my evening and hopefully next time I ride, I will get that trick on camera. With both the NHL and NBA playoffs occurring, it's nice to get some big screen action. Joe Dog's hosts a wing night every Thursday evening which is nicely complimented by three projectors and many other televisions with games and highlights.A pound of wings is $3.50, with a large selection of flavors (I always order the "Sweet Alabama"). So if you and your friends want to catch a game on a Thursday night, try enjoying it with drinks and wings. This past Tuesday, Dallas, JJ, Mike and I went to Amigo's to check out Shad. 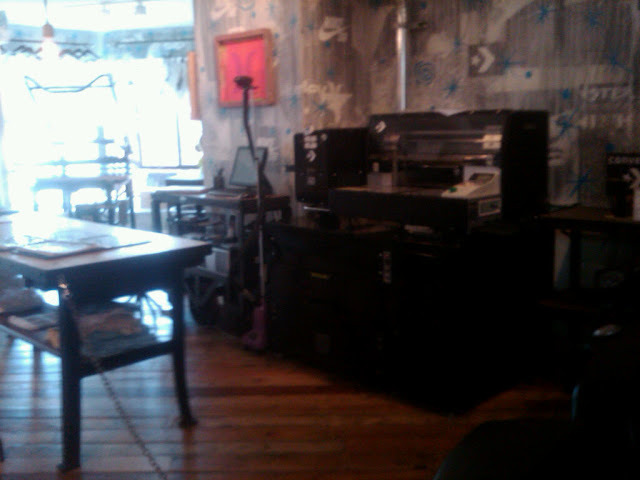 The few performances that I attended at Amigo's were great, always a wide selection of drinks, people and music. The crowd at this show were much younger and rowdier to say the least. Putting that aside, the music was great. I took some pictures and videos to show people who had missed the show. The music is a bit distorted, but you get the picture. Alexander's is a great place to enjoy a meal, especially in the summer. The patio is great and the restaurant is always open fairly late. 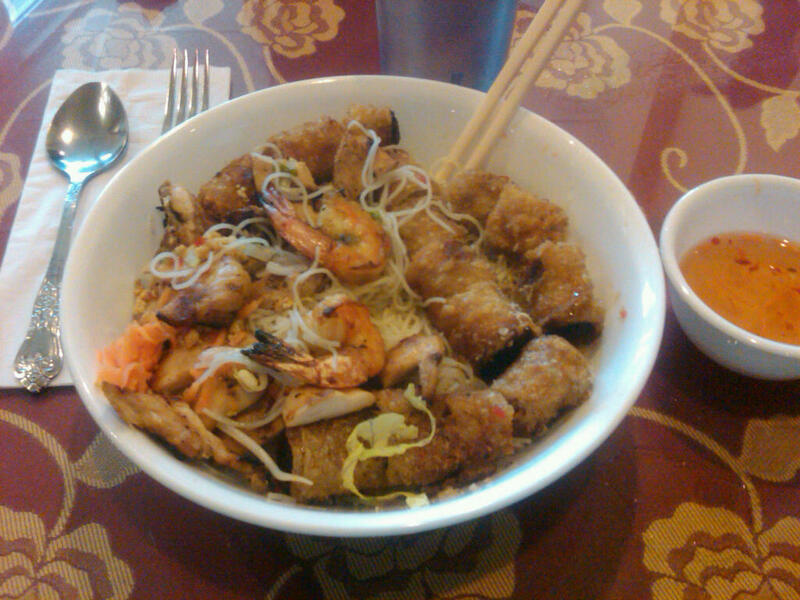 You can always expect to have fresh food and good service. It has that cafe feel on the bottom level and more of a bar feel on the top floor. 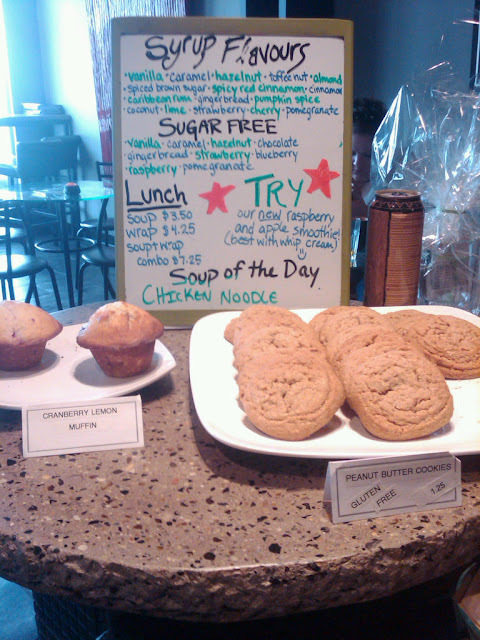 Alexander's is well known for it's sandwiches, wraps, salads and especially their desserts! 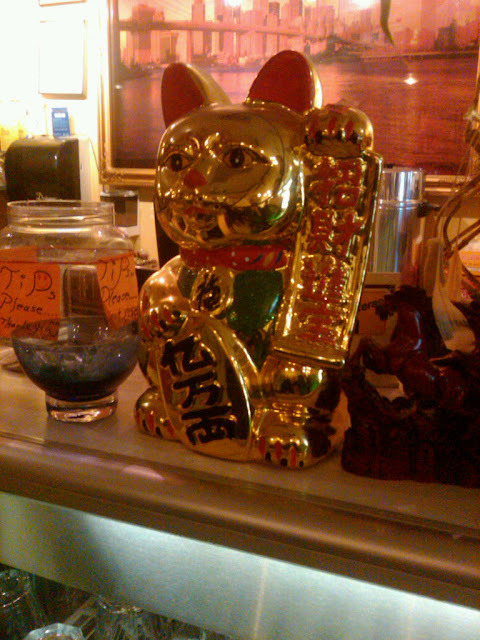 Pricing ranges from $8 to $30, but most of the meals are located underneath $15. The location is really convenient being near the school (Cumberland & College, right beside Subway) but parking is sometimes a hassle. Personal favorites at the restaurant are the quesadillas, chicken caeser wrap, poutine, cheesecake and salads. Last weekend I moved into a Lakewood townhouse with my brother and unfortunately we're stuck without internet until the 9th, so I've found myself getting my web fix at Moka Coffee Bar as they offer free wifi and just as their slogan says, they are literally "Just Around the Corner". 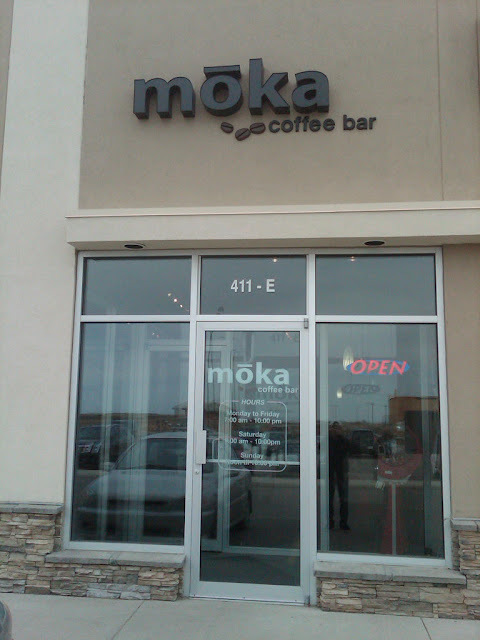 Moka is a fairly new coffee shop that was opened in December 2009 by Lynn Derksen and Vickie Fulawaka and it seems to be getting progressively more popular. I personally was introduced to it fairly recently by my friend Erin Quiring (below) who was hired there in January. 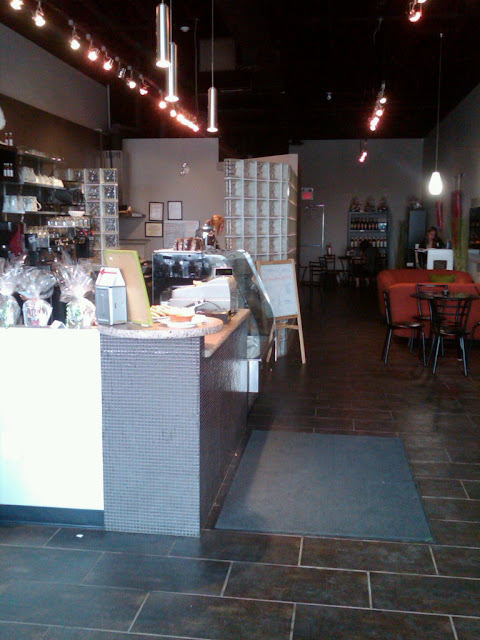 Moka boasts an extensive menu of drinks, pastries, and cakes, as well as several soups and wraps, a menu that is sure to fulfill the desire of any customer to walk in. Their beans are supplied by JJBean and Land of a Thousand Hills, and unlike most shops around the city, their tasty treats are made in-house every day. Another aspect of Moka that I love is that they display the work of local artists on their walls. This has been attracting a lot of interest and the display time slots are now booked until Spring 2012. The artist currently on display is Brooke Graham (voted Saskatoon's best traditional media artist of 2010). 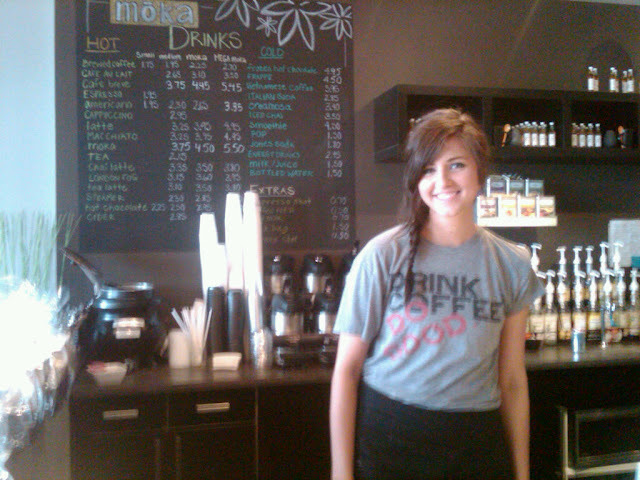 If you're ever in South East Saskatoon, drop by Moka Coffee Bar. The best Americano you've ever had is "Just Around the Corner". I managed to get a couple of my final exams moved so that I could be a staff member on a high school spring-break trip to California last week. At first I wasn't sure it was going to work out, but when everything fell into place I got stoked! 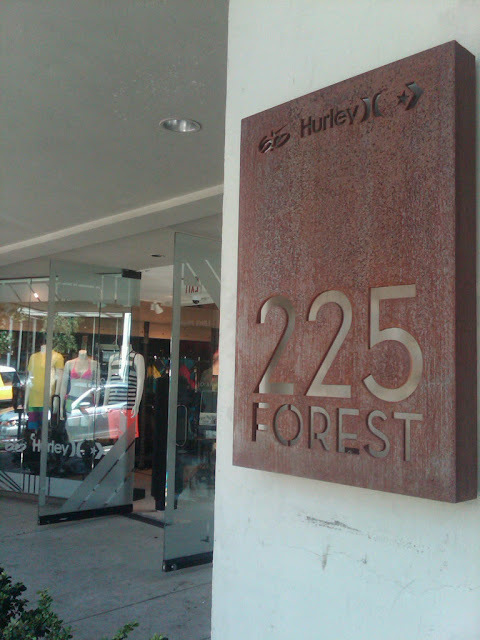 225 Forest is both the name of the store, and the address (225 Forest Ave, Laguna Beach, CA). It is a collab. between Nike, Hurley, and Converse, and they simply use the address as the store name so as to avoid focusing on one brand more than the others while providing a local home-grown feel. This is one of my favorite shops based on the creativity represented as soon as you walk through the doors. From exposed brick and steel i-beams, to unique artwork and custom displays, 225 Forest is different than any other skate shop or clothing store that I've seen so far. Good flava flav. 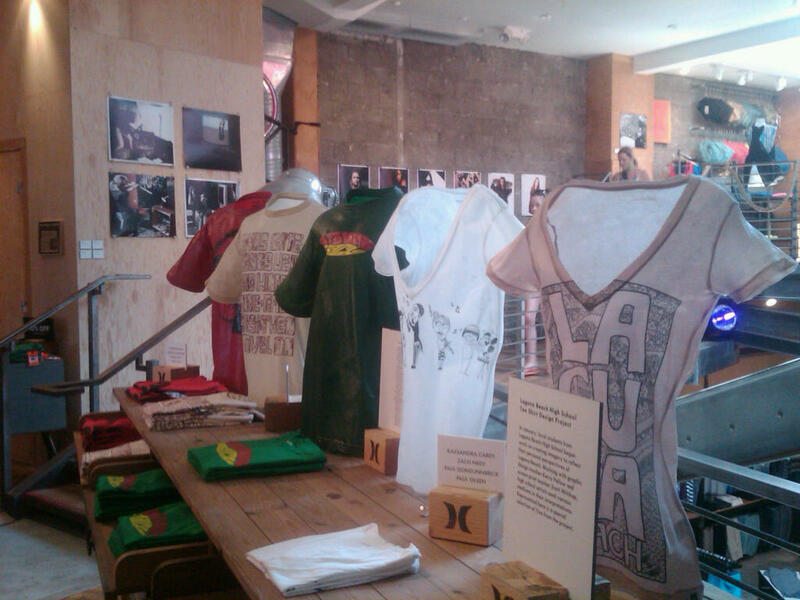 Above are t-shirts and artwork created by youth from a local Laguna high school. They created the artwork that was printed on the shirts, and then coated the display tees in surfboard resin which is what allows them to stand freely. The shoe display wall above was created by framing a wall with spruce 2x4's and then wrapping hose around the studs from top to bottom. 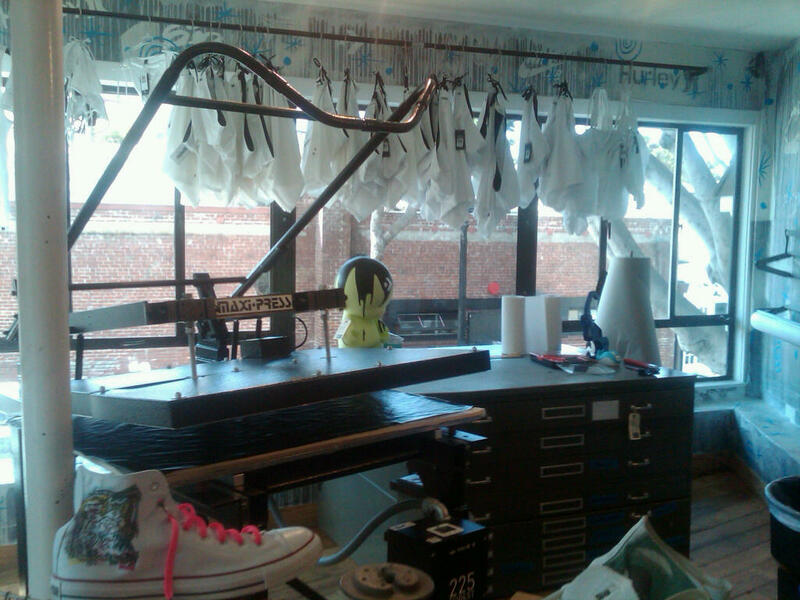 225 Forest also reps a silk screen machine and a custom shoe press in the upper level of their store. 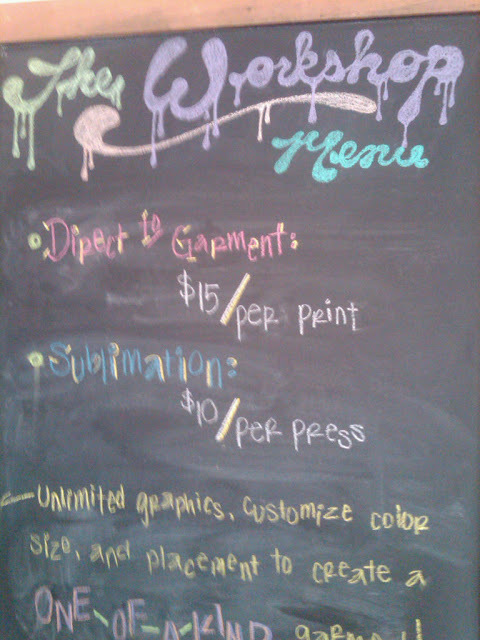 Above is 'the workshop menu', and below are the two presses. 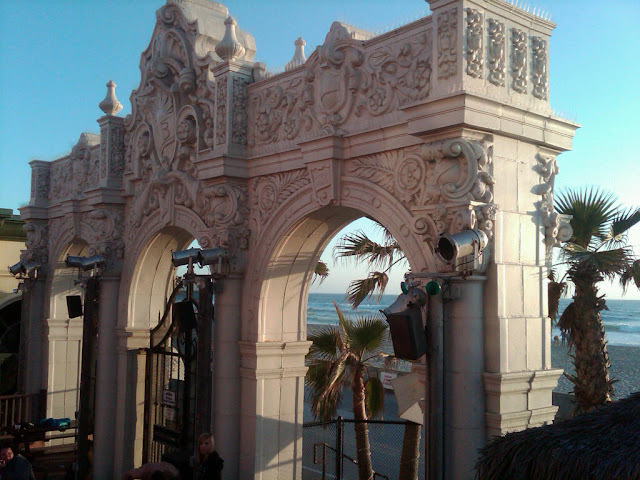 The Wave House is located on Mission Beach, San Diego, CA. It includes an outdoor bar and grill, as well as two 'Flo-Rider' standing waves for customers to try surfing and a variety of different shapes and sizes of boards. 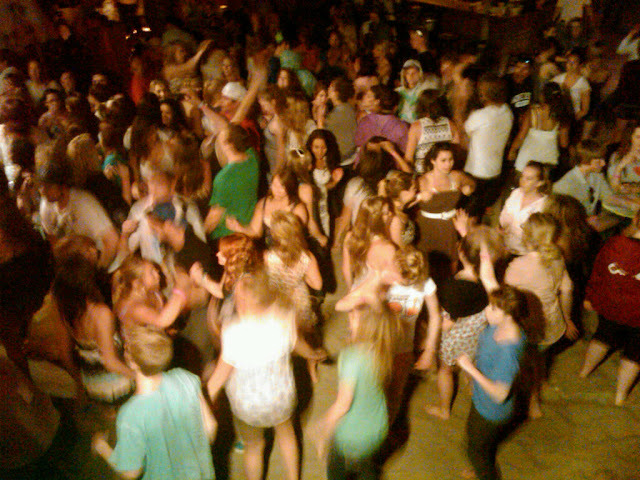 We rented the place out for an evening and had an unreal time. 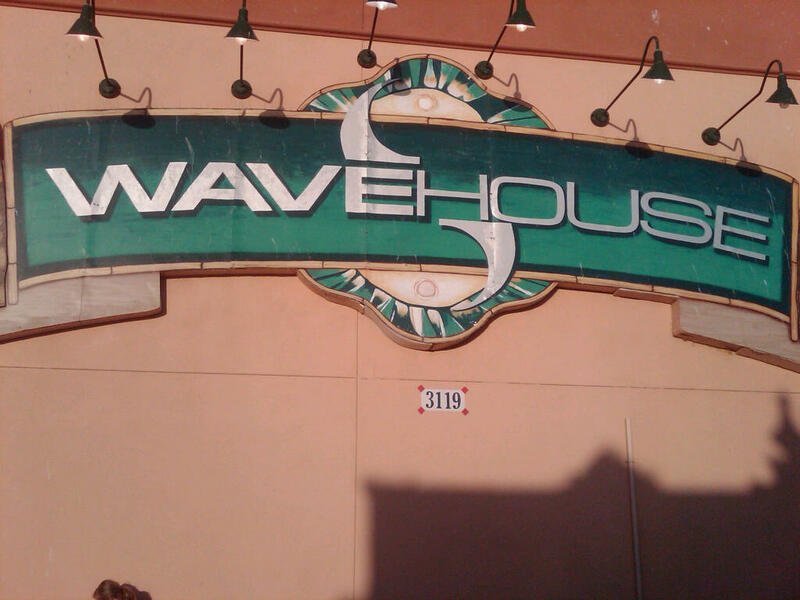 Below is the entry level wave, which is the one that we rented for our less experienced prairie high school students. We had a lot of fun trying to master the Flo-Rider, and also enjoyed a delicious BBQ buffet provided by the WaveHouse staff. After a solid couple of hours on the Flo-Rider, we threw a high-energy limbo contest and dance party that will surely never be forgotten. In-N-Out burger is a chain of restaurants concentrated in the south-western United States, which is a crime to humanity as everyone should have the opportunity to indulge in the glorious bombardment of tastes and smells that exist at this restaurant. 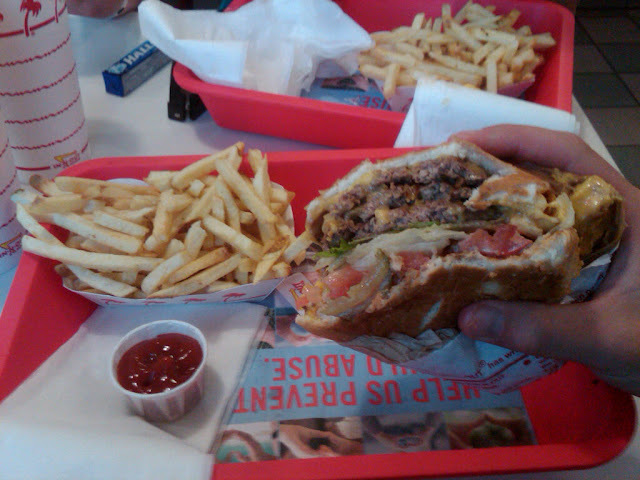 The picture below is my 4x4 Animal Style Burger. Legendary. 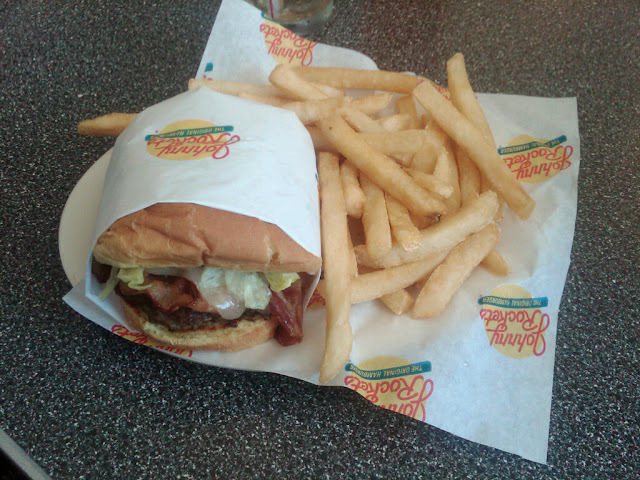 Johnny Rockets is another great burger joint located in the USA. It resembles a 50's diner, and possesses a high-energy atmosphere. I was able to visit on several occasions during our visit. The picture below is my St. Louis Burger, which I washed down with several ice cold glasses of Vanilla Coke. Dreamy. Today was a lot more tiring and felt much longer. We began with some brunch here at the Botanica restaurant. First thing we did was headed downtown to do a bit of shopping, the plan was to find a shirt and tie. We didn't have too much luck over at Holt Renfrew, but then I ran into Henry Singer for my first time. With the exceptional service I received, I managed to find exactly what I was looking for. The next thing we did was traveled over to Whyte ave. to check out Gravity Pope and Foosh, we didn't come out empty handed at either. We went back to West Edmonton Mall to fulfill our afternoon of shopping. But at that point of time, I think we were all pretty beat with the amount of walking and power shopping we did all day. It was nice to come back to the hotel to have a late dinner at Vic's Steakhouse. We had a good day and finished it off with drinks, now I am ready to get to sleep and come home tomorrow.